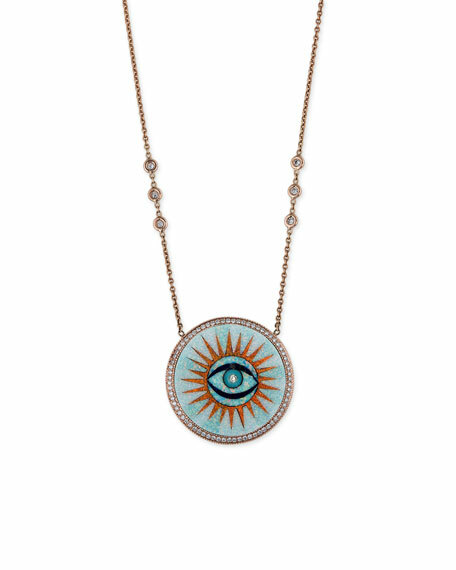 Opal inlay eye pendant necklace by Jacquie Aiche. Integrated round eye pendant with opal inlay. Full white diamond pavé as pendant trim. Diamond eyeglass stations detail chain. Devon Leigh beaded necklace with long pendant. 18-karat gold plated brass three-tiered pendant. Green garnet, malachite and chrysoprase beads. Three drops form teardrop silhouette. Adjustable; lobster clasp. Approx. 30"L. Made in USA. EXCLUSIVELY AT NEIMAN MARCUS Hipchik "Imogen" beaded pendant necklace. Mixed beads, including pumpkin, turquoise, rondelles, and baroque glass simulated pearls. EXCLUSIVELY AT NEIMAN MARCUS Hipchik "Imogen" beaded pendant necklace. Mixed beads, including pumpkin, turquoise, rondelles, and baroque glass simulated pearls. Sliced agate pendant at Y drop. Approx. 22"L; 2.5" drop. Please note: Due to the nature of the material pendant size, shape, and color may vary. John Hardy necklace from the Naga Collection. Sterling silver with brushed finish. Naga dragon pendant with blue sapphire eyes. Approx.